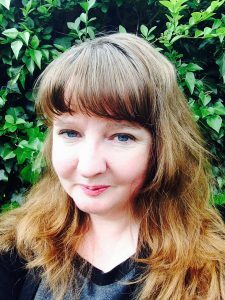 Welcome to Rose McGinty, author of Electric Souk. Thank you Ruby for inviting me to share my top ten novels. It’s been really intriguing choosing them from an impossible long list, and with the exception of Elena Ferrante who I discovered a couple of years ago, I am taken by how my favourites are all novels I first read some time ago. This set me thinking about why I’ve chosen these, rather than another ten I could list that I’ve read in the last two years and absolutely love and admire too. I think it’s because the ten here are old friends that I’ve turned to again and again, and with Ferrante I know for sure I will. I’m also struck that now I am a writer myself I read them differently, seeing new depths and treasures that I can learn from and I hope anyone interested in my list might also find the inspiration I have found. Tolstoy was clearly the master of the tweet long before Twitter was invented. This must be one of the most brilliant opening lines and synopsis of a novel ever. I am awed by novelists who can open their novels with such potency. And it isn’t only of course the opening line that is so perfect about Anna Karenina, I suspect it is one of the most perfectly written novels ever. The sensitivity with which he switches from the devastation of the peasants lives to that of Anna’s heart is pure mastery, and beyond the writing, I cry with Anna over every betrayal by her lover, Vronsky and her fate; and I cry too for her broken, devoted husband and child. Roddy Doyle has called Jennifer Johnston ‘the best writer in Ireland.’ I have read almost all her work. Her writing is like no other in its tautness, every single word counts, devastates. She takes moments of history, the trouble in Northern Ireland, the Irish Uprising, the World Wars, with the deepest of emotions and fits them in a tea cup, exploding the most intimate, claustrophobic of domestic scenes, family betrayals onto the rubble of war. Picking just one novel is incredibly hard. I have chosen Shadows on Our Skin as the most perfect illustration of Johnson’s art. Word by word we hope with Joe, the young, lonely, dreamy schoolboy in the middle of the troubles in Northern Ireland as he develops a beautiful friendship with fragile Kathleen, a young school teacher. When his brother returns from London with attitude and a gun and also takes an interest in Kathleen, we fear each new word. As a child I hated The Mill on the Floss due to a terrible, hammy television version I endured of a Sunday evening. I rediscovered George Eliot when my grandmother moved to her home town of Nuneaton. I lived there with her for a while and the rivers and streams held a fatal fascination with the local children and we were always getting into no end of trouble messing about in the Brookie, a stream flowing from the River Anker. I loved sitting on the river bank watching the water stream through the long, grasping weeds. 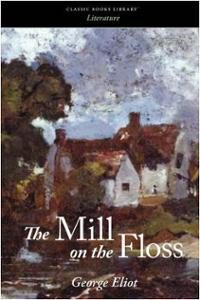 In the end I wrote my M.Phil thesis at Trinity College, Dublin about Maggie Tulliver’s strength, integrity and emotional purity in The Mill on the Floss. And as I write this now I realise how much Maggie and Tom have influenced Electric Souk and the characters and fates of brother and sister, Laila and Hisham. The brilliance of this story within a story just dazzles me. It is a reader’s own infinity puzzle. I can’t say too much about it’s genius as I don’t want to write a spoiler, as anyone who hasn’t read it deserves to be able to make their own discovery about the magic of this tale. 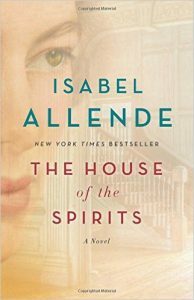 Isabelle Allende starts The House of the Spirits with a letter to the grandfather. This is one of the best ways to start writing as a new writer. It can really help you overcome the terror of the first blank page, and it’s how Electric Souk begins, with Aisling scribbling a last, desperate note as she flees the desert. I am drawn to the way that for Allende and the magical realists, the personal is political and vice versa. The love and passing of wisdom, protection and magic between the generations of women also stands out for me in contrast to the violence and persecution handed down from the colonists to the dictatorship in more recent Chilean history. This is an obscure choice that you will struggle to find on the book shelves. I first found this mysterious story about a young girl, called Rosa, haunted by a portrait, when I was living at my grandmother’s and took it out of the local library. The story switches centuries, has ghosts, a strange blue eyed man, missing fans and a snowy maze, where the climax of its quietly thrilling adventures unfolds. Nothing is as it seems and the beautiful, oblique writing is as much a maze. After we left my grandmother’s, this story haunted me and I took it out every time we visited until one day it was no longer in the library. That then provoked a twenty year long search, before the days of the internet and being able to easily trace books that had gone out of print. I scoured every second hand bookshop in every town I visited over the years, my own maze. I finally found it in Kent, where I now live, in Baggins Book Bazarre in Rochester. Once you’ve read Wuthering Heights you can never escape its cruel wilderness on the moors, out of sight of god or love, like Cathy’s ghost. The bravery and natural skill of Emily Brontë to write with such rawness and honesty still stuns me and remains fresh every time I return to this novel, after thirty years. Each time I find something new there, darker than before. 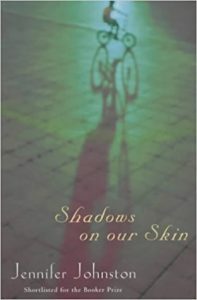 Joyce’s beautiful, sorrowful, evocative collection of short stories takes me back to the smell of turf burning on damp, dark nights in Dublin. 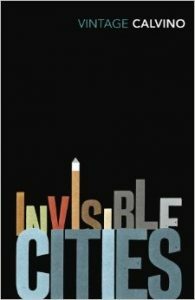 Critics have said that Joyce’s writing in this collection defies categorisation, his voices are unreliable and his writing opaque – for me, his depiction of Dublin unites the collection, the precise, poignant mapping of the city and how its character interacts with the people, the characters who live there. Dublin is a catalyst in each story for a character to have a moment of illumination and those moments of illumination speak for a time in Irish history where there was a great flux of ideas, identities, hopes and despairs, and this is the greatness of Joyce. I return to this novel time and again when I feel life is too much like a never-ending winter. It transports me to the lilac groves of an Italian spring. I love and am always refreshed by its celebration of the healing nature of solitude, gardens and female friendships. Elizabeth Von Arnim’s sharp wit and observations, and the simplicity of how she writes a deeply layered story, is a masterclass. 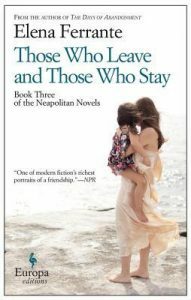 I’ve picked the third novel in the Neapolitan novels because of the four, I think it is the one that speaks most to writers. Elena’s writing life is at the fore in this novel and constantly in combat with her best friend Lila, her past, her husband, family and society and through this struggle we see the epic changes in Naples, Italy, the working class and women’s place in the world. Ferrante’s writing is compulsive and all consuming. You cannot just pick up a novel and put it down to be read again a few hours later. It is utterly immersive, you smell, touch, taste and hear every molecule of Naples. She is a writer’s writer, and the Neopolitan novels, are novels that I will turn to again and again to learn more about this craft. 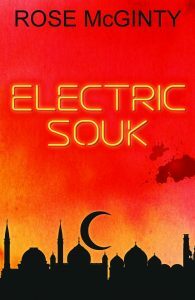 Rose’s debut novel, Electric Souk, will be published in March 2017 by Urbane Publications and will be on promotion in W H Smiths in May. Humanity blisters in this haunting, lyrical thriller about trust and treachery. Ireland’s gone bust, and with it Aisling Finn’s life. She flees austerity for adventure in the desert. But the Arabia she finds is not that of her dreams. Everyone is chasing a fast buck, a fast woman and another G&T. Expats and locals alike prickle with paranoia. Debonair fixer, Brian Rothmann, charms Aisling with champagne brunches and nights at Bedouin camps. But is Brian a hero or another desperate expat prepared to go to any lengths to get what he wants? Is this Aisling? Or is he using her as bait? Her only hope is Hisham, a local activist. But where do his loyalties lie? Aisling faces severe peril when the expat and desert worlds collide, as the Arab Spring erupts. Rose is an alumna of Faber Academy 2015/16. By night she is a writer, by day a NHS Director in London and has worked internationally. She studied literature at the University of Kent, Canterbury and her M.Phil at Trinity College, Dublin. Winner of the inaugural Kent Life magazine short story competition with her story, Dreamland, published in the April 2016 issue and aired on Channel Radio, Kent Life. Winner of the Scottish Ghost Story competition 2016 for her story A Kentish Longtail, which was read out at the Festival of Dreams at the Scottish National Library in October 2016 and can be viewed on YouTube. Rose is now writing her second novel, a psychological thriller, which is taking her to some rather gothic hospital corridors. Find out more at Rose’s blog.